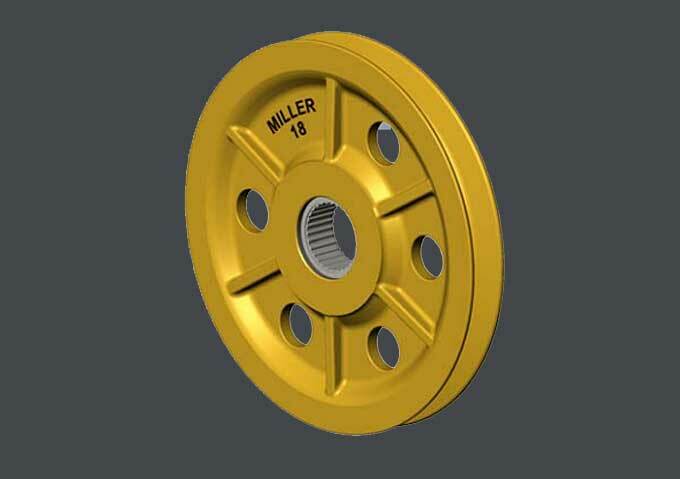 Miller Standard Cast Steel Sheaves are designed for use in Miller Hi-Lift and Miller Mobile Crane blocks but can be used as readily available components anywhere. Whether as replacements for Miller blocks or for any assembly needing wire rope sheaves, these heavy duty cast alloy steel sheaves are are available in stock for any application. Our Standard Cast Steel Sheaves are available from 8" to 30" in diameter for up to 1 1/2" wire rope. Sheaves are furnished with standard roller, taperered roller, or full complement double row roller bearings, bronze bushings, or with a plain finished bore.